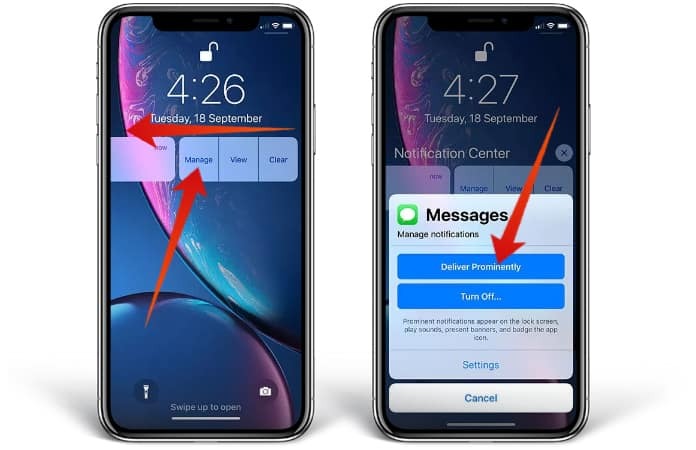 iOS 12 has a feature called ‘Instant Tuning’ – it allows people to adjust and configure notification settings without going to the Settings menu. If we’re to rephrase that, it enables users to swipe on a notification and ‘mute’ a chosen app immediately without requiring them to leave their Notification Center or Lock Screen. Basically, if the app is configured to send ‘quiet notifications’, those notifications don’t display on the lock screen. There’s also no sound given by the device or banner at the top of the Home screen. 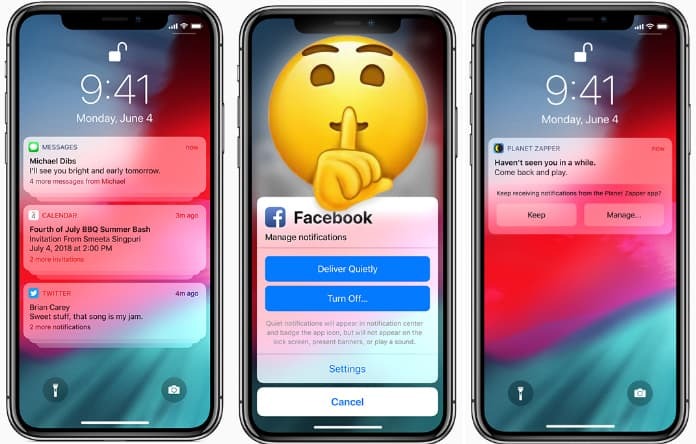 You can find the option for quiet notifications inside the Notification Center, which can be accessed by swiping down from the top right corner of the screen if you’re using the iPhone XS Max, XS, or X. Basically, it lets you filter out irrelevant notifications. First, find a notification on the Lock Screen or open the Notification Center by swiping down from the top-left or top of your screen. Once you’ve picked a notification, swipe from the right side to the left side on it. You’ll then see some options displayed. Tap on ‘Manage’ and then ‘Deliver Quietly’. Alternatively, the notifications can be completely turned off for the specific application. All you need to do is tap ‘Turn Off’. Doing so will prevent them from appearing as banners or pinging the device, but they’ll also disappear from the Notification Center. Another thing you can do is tap ‘Settings’ to access an app’s exclusive notification menu. From there, you can preview options, change banner sounds, as well as banner styles. The steps only apply to the setting for ‘deliver quietly’ for specific apps, like Facebook and Messages. You’ll need to follow these steps again if you want other apps to send off quiet notifications. Some users may want a specific app to give off standard notifications – in other words, they want to disable ‘Deliver Quietly’. It can be easily done with these steps. Open the Notification Center and search for a quiet notification. Then swipe from the right side to the left side on the notification that you want to associate quiet notifications with. Tap ‘Manage’ and then tap ‘Deliver prominently’. If there’s no notification pending from that particular application or you decide to ‘Turn Off’ the notifications completely, you’ll have to go into Settings. Go to Settings > Notifications and select the application you want to activate notifications for. While you’re at it, also ensure the Banners, Sounds, and Lock Screen are also working (their toggles should be on.). And that’s it. You’ve activated your very first quiet notifications. Enjoy and feel free to spread the word by sharing this article among your friends and family.